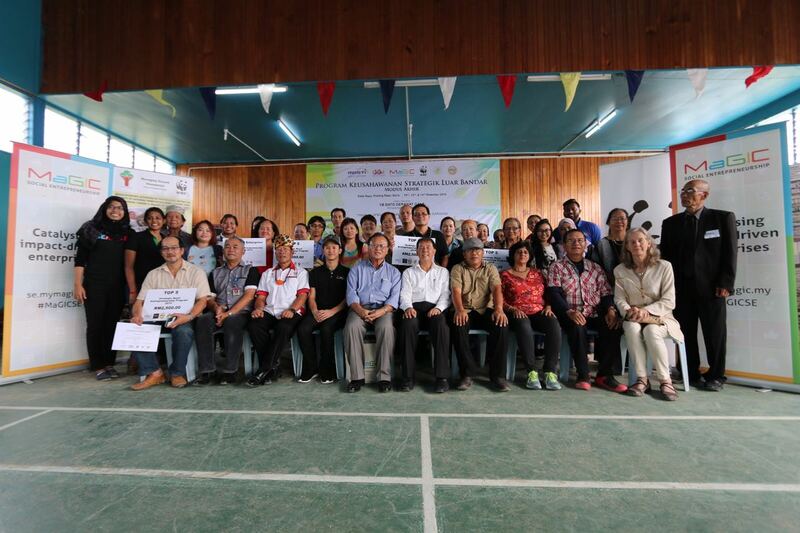 Participants and winners posing for a group photo with their programme facilitators and judges, as well as invited guests (seated, fifth from left) Political Secretary to Chief Minister Dato’ Robert Laing Anyie and Piasau Assemblyman Dato’ Sebastian Ting Chiew Yew. © WWF-Malaysia / Deborah Andrew. 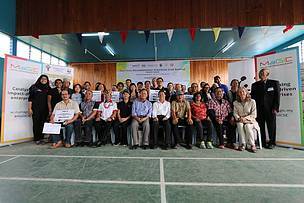 29 December 2016, Bario: After a year-long collaboration on Rural Strategic Entrepreneurship Programme in the highlands of Bario by Forum Masyarakat Adat Dataran Tinggi Borneo (FORMADAT), WWF-Malaysia and Malaysian Global Innovation and Creativity Centre (MaGIC), the programme was successfully completed recently. 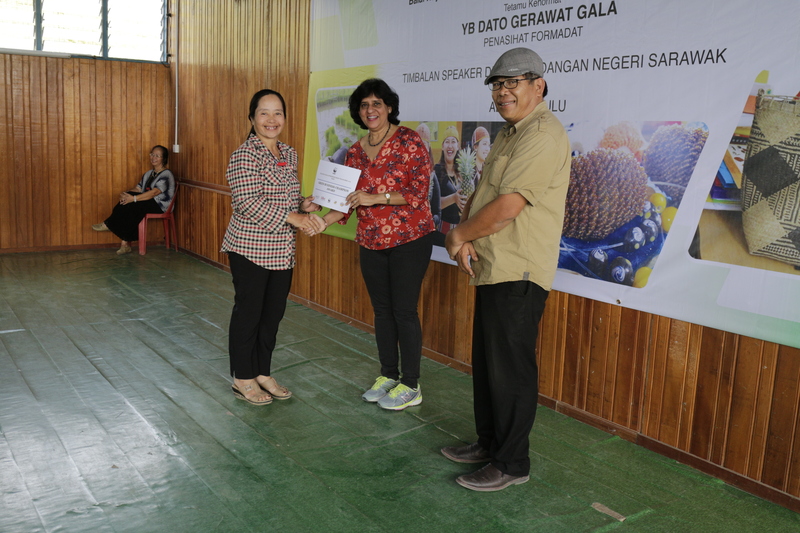 A total of 46 entrepreneurs in Bario were short-listed to join the programme last May and only 18 of them graduated in this programme which ended here on December 14. Five participants won the Best Business Proposal with RM2,500 monetary prize each from MaGIC, and they are Caleena Lallang Sakai, Jerome Jiak Ipa, Agan Lio Apoi, Victor Lian Munan and Jeanette Ulun. Caleena also bagged the Best Social Entrepreneur Effort and will be mentored by MaGIC. Three others namely Agan Ngelong, John Pasan and Rosly Meria won Green Business Champion Award from WWF-Malaysia. The award supports three best green initiatives proposed during the four minutes business pitch. Two of the initiatives are closely related which is pineapple waste composting and recycling while the third initiative is replanting of trees used as firewoods for mountain salt cooking. MaGIC SE’s Execuitive Director Ehon Chan praised Bario for the commitment shown by the praticipants and their efforts throughout the year. WWF-Malaysia Conservation Director Dr Sundari Ramakrishna, who was one of the judges of the programme, in her closing remarks, said WWF-Malaysia invited MaGIC community team to visit highlands in Sarawak to create awareness on the impact of social enterprise for people and environment. The purpose was to instil interest among local communities in the highlands to start or manage existing businesses in a more sustainable manner and create positive impact in rural areas, she said. The programme was held in Long Semadoh, Ba’ Kelalan and Bario. MaGIC selected Bario to continue with the year-long training because the community there are already enterprising and many have started their businesses. She also suggested replicating the Rural Strategic Entrepreneurship Programme not only to other parts of the highlands but also other rural areas in Sarawak in the future. Bario was chosen as a pilot site for this programme and it would set as a good example. Over the years, Dr Sundari said, WWF-Malaysia has been working with FORMADAT to achieve balance in local livelihoods and the conservation of nature. Datuk Robert Laing, who represented Mulu Assemblyman Yang Berhormat Dato’ Gerawat Gala said that, “MaGIC can teach us how to change our attitude, but they cannot change our attitude." He also said the Orang Ulu has a lot to catch up as it is not their norm to be entrepreneurs historically and hoped that MaGIC will organise more of this type of event to train more entrepreneurs among the Orang Ulu. WWF-Malaysia Dr Sundari Ramakrishna Conservation Director (centre) presenting the Green Business Champion Award to one of the winners Rosly Meria, as FORMADAT Sarawak Deputy Chairman John Trawe looked on.